Given that the month of March was packed with an unusual amount of high budget, blockbuster films, I figured I would balance things out with a couple of independent/arthouse features as well. 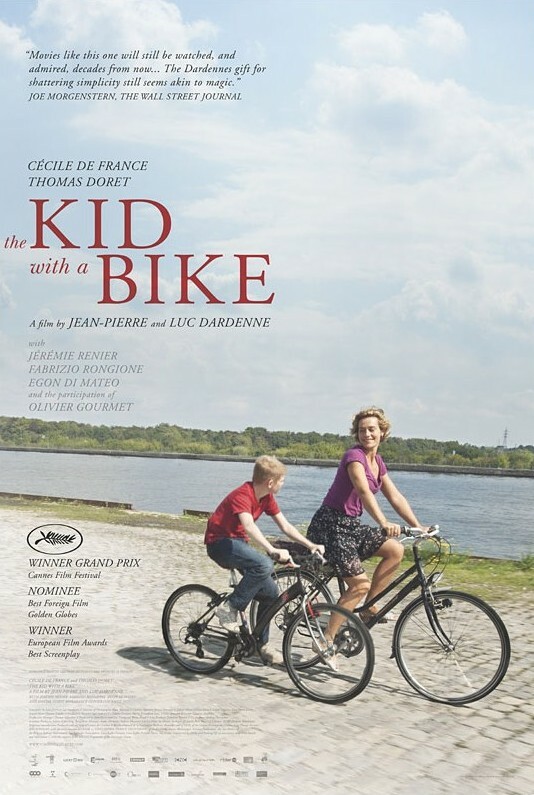 One of these was The Kid with a Bike, a Belgian film from the Dardenne brothers (Jean-Pierre and Luc). This film follows a young boy dealing with being abandoned by his father and attempting to forge new relationships with other potential role models and caretakers. The film is very naturalistic, a key type of style when it comes to the Dardenne’s work, as it plays out as more character-driven, as opposed to story-driven and plays around a lot with ambiguity, despite straddling a somewhat familiar path. With that in mind, the film is very good, well-acted, and filled with moments that evoke emotion as well as thoughts based around developing more of an understanding for one’s self, rather than letting the film tell you what to think. The film is set in Seraing, Belgium. It begins with a boy hopelessly trying to call his father’s phone, which has been disconnected. We soon learn that this 11-year old boy is Cyril (Thomas Doret) and he has recently been placed into foster care. Not taking this easily, however, Cyril is set on finding his father and his lost bike. After various escape attempts from the foster home, Cyril manages to get far enough to reach his old apartment building, only to confirm that the room is in fact empty. During all of this, Cyril tries to evade his caretakers and at one point runs into a doctor’s office. There, he runs into Samantha (Cecile de France), who owns the local hair salon. Having been taken back to the foster center, Cyril is relieved to find that the next day Samantha has brought him his bike. At this point, Cyril likes Samantha enough to ask if he can stay with her on weekends. From this point, Cyril continues to search for his father, while also dealing with his new relationship with Samantha, along with other kids who live in the area. As I’ve stated, I think The Kid with a Bike is very good. I have particular regard for the two lead actors in this film. Starting with the young boy, Thomas Doret does what I believe to be pretty fantastic work in this film, conveying a confused amount of emotions throughout, as it becomes more and more clear to him that he needs to set his focus on new relationships. There is also the issue of his petulance, which I can see as being understandably grating, but I also see as an understandably identifying characteristic of a young boy not quite knowing how to deal with the rocky state of his living situation. All of this and Doret also manages to bring a certain level of physicality to his role. For being a dramatic feature, watching Doret ride his bike, evade his caretakers, and climb up and down various obstacles, I could totally picture this little boy growing into the role of a young action hero. That might sound absurd, but given how much I felt the physical performance was nearly just as strong as the emotional one, I would say that I am not entirely unfounded here. In regards to Cecile de France, this is a woman, whose character may be trickier to fully comprehend, but at the same time, the ambiguity of some of her choices makes the film all the more intriguing. While watching the film, I began to wonder why Samantha would agree to make certain choices and felt distracted by the film for not properly establishing this. However, I soon also began to think that the film really did not need to explain so much and I felt more strongly towards forming ideas of a backstory on my own. With that said, Cecile de France did some great work throughout this film, as she deals with her new role as guardian to a child she hardly knows. The way her understanding of situations comes into play during this film is quite affecting; with a key example occurring during a scene when a very particular, impromptu choice needs to be made. As for the rest of the film, its construction is quite sound. With few exceptions, I feel the supporting cast was fairly strong throughout. I enjoyed the fairly free-flowing nature of the plotting. Yes, the film does have an arc of sorts, in terms of how Cyril ends up in his journey, from attempting to find his father to learning to adjust to a new sort of life, but this is all handled in a way that feels natural, as opposed to necessary plot mechanics forcing the film down a certain path. There is very little music in this film, with big moments of score only coming in to further emphasize key moments in the film (still not too sure how I feel about that) and everything else basically working with sounds occurring in the moment. 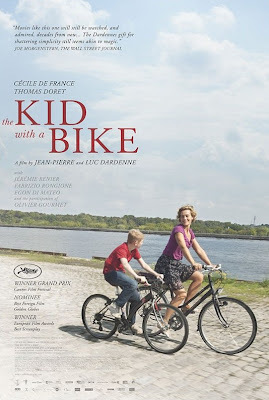 I am aware that the Dardenne’s have done similar things in their past films, with The Kid with a Bike being probably their most accessible film yet, but I certainly think they have done quite a good job here. One thing I did not really get to was addressing the bike’s role in this film. I believe there is obviously a lot to associate with this item that the boy is so desperate to cling to (and who wouldn’t? It’s your childhood bike). It is an easy way for one to latch onto and associate many thematic points of the film to. 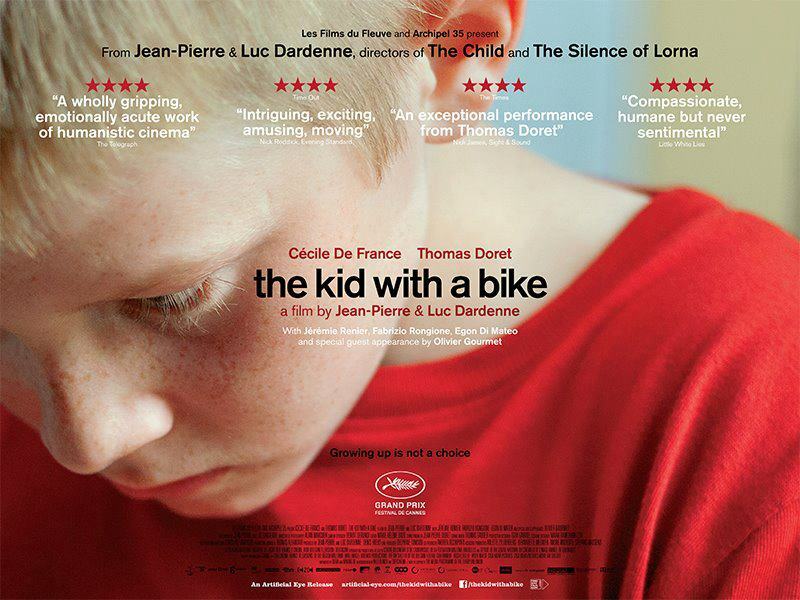 I am not going to shed much more light on this, as I feel The Kid with a Bike is a fine feature that deserves to be seen by those seeking a strong drama, featuring an engaging story, full of emotion and seemingly natural performances. Additionally, when one does see this film, given how much the Dardenne’s have personally stripped away to better set someone up to think for themselves about the film, I would encourage deciding what one thinks about the bike’s role in this story. That said, maybe I’m over-thinking it and Cyril’s just a big fan of Pee-Wee. Cyril: You won’t be calling me?